Paleoclimatologists have long suspected a correlation exists between abrupt temperature changes in Greenland and in Antarctica, but ice cores from the two locations weren't detailed enough to link the changes in the two regions. A new ice core from Antarctica, however, directly correlates abrupt changes in Greenland's climate over the last 150,000 years with counterpart changes in Antarctica  offering further indication that the two icy regions are connected by ocean currents in a sort of bipolar seesaw. 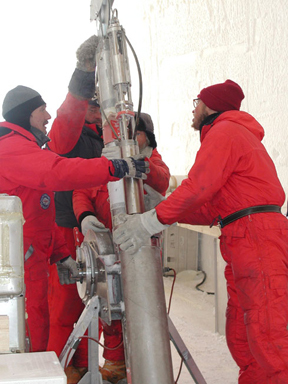 Researchers on the European Project for Ice Coring in Antarctica (EPICA) team drilled a new ice core in the Atlantic portion of Antarctica that is revealing that climate changes in Antarctica are related to changes in Greenland. Photo is courtesy of EPICA. The European Project for Ice Coring in Antarctica (EPICA) team pulled up a core from the Atlantic sector of Antarctica that was about 2.5 kilometers long and dated back 150,000 years, as they reported Thursday in Nature. Using mass spectrometry, they analyzed bubbles of methane trapped in the ice that showed temperature changes over time. The team now has a high-resolution, centuries- to millennia-scale record of temperature changes in the Atlantic part of Antarctica, says Hubertus Fischer of the Alfred Wegener Institute for Polar and Marine Research Glaciology in Bremerhaven, Germany, lead author of the new study. The team found that over the past 150,000 years, the record in Antarctica was marked by occasional spikes in temperature both upward and downward. Researchers had seen similar abrupt changes in ice cores collected in Greenland in the 1980s and 1990s, but had been unable to attribute it to anything other than regional phenomena, says Eric Wolff of the British Antarctic Survey in Cambridge, United Kingdom. Isotopes indicated that temperatures jumped as much as 10 degrees Celsius within a few decades at various times. The temperature record in Antarctica recorded in the new core now directly corresponds to the timing of these rapid jumps in Greenland temperatures, Fischer says. The findings suggest that as Antarctica gradually warms, Greenland cools. Likewise, as soon as Greenland's temperature starts warming up, temperatures in Antarctica start to fall. And that's not just the case with temperature spikes, Fischer says. "Even the smaller wiggles are directly related," he says. This change is "astoundingly regular." Climate models suggest that the roughly inverse relationship the EPICA team observed is the result of a large change in heat in the Atlantic, Fischer says. The global pattern of currents known as the ocean conveyor belt shuttles warm, salty water northward from the Southern Hemisphere up along the coast of North America and around Europe, keeping the climate mild in these areas. As it carries heat northward to the North Atlantic, it depletes the South Atlantic of heat, thus warming Greenland and cooling Antarctica. Similarly, a slowdown in the strength of the currents could also cause a so-called positive feedback in the Southern Hemisphere: Instead of the warm water moving northward, it would stay in the south and warm up Antarctica. The new core data should help researchers test current climate models, Wolff says. And understanding how Atlantic currents have connected Greenland and Antarctica over the past 150,000 years may help researchers strengthen climate models that project future slowdowns or shutdowns of the Atlantic currents, he says. Researchers know that the ocean conveyor belt has slowed significantly and even shut down in the past during periods of abrupt climate, due to large ice melts from Greenland or the Arctic Sea, or changes in precipitation or ocean evaporation (see Geotimes, November 2006). The data should help strengthen climate models, but why these temperature changes occur is not entirely understood, says Stefan Rahmstorf, a physical oceanographer at Potsdam University in Germany. "I'd put my money on some regularly varying external factor, which causes a critical oceanic threshold to be crossed and triggers events," Rahmstorf says, but finding the answer is "one mystery waiting to be solved."